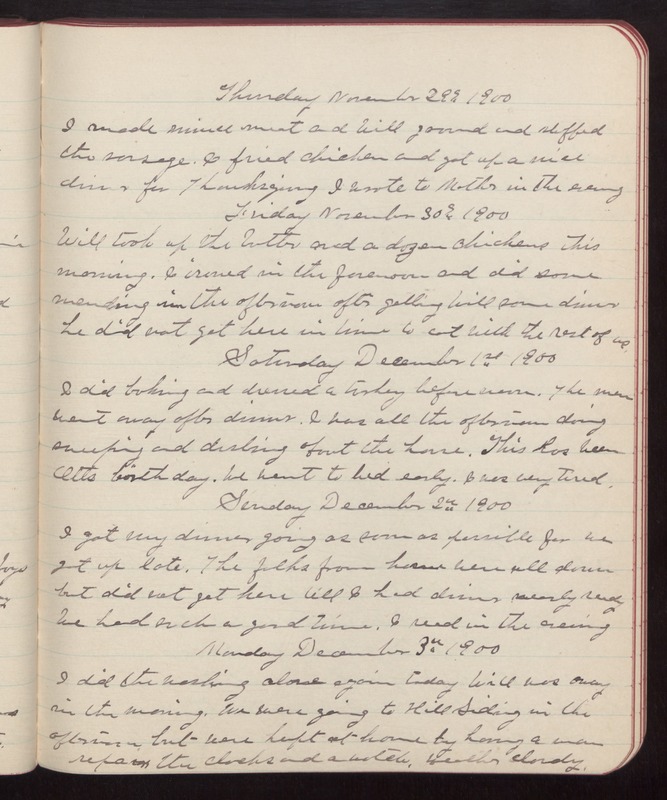 Thursday November 29th 1900 I made mince meat and Will ground and stuffed the sausage. I fried chicken and got up a nice dinner for Thanksgiving I wrote to Mother in the evening Friday November 30th 1900 Will took up the butter and a dozen chickens this morning. I ironed in the forenoon and did some mending in the afternoon after getting Will some dinner he did not get here in time to eat with the rest of us. Saturday December 1st 1900 I did baking and dressed a turkey before noon. The men went away after dinner. I was all the afternoon doing sweeping and dusting about the house. This has been Otts birthday. We went to bed early. I was very tired. Sunday December 2nd 1900 I got my dinner going as soon as possible for we got up late. The folks from home were all down but did not get here till I had dinner nearly ready We had such a good time. I read in the evening Monday December 3rd 1900 I did the washing alone again today Will was away in the morning. We were going to Hill Siding in the afternoon but were kept at home by having a man repair the clocks and a watch. Weather cloudy.